Once again, Catmax ensures that cats roam at home! 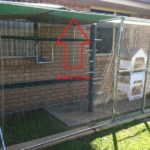 Earlier this year Catmax’s Managing Director, Paul Chapman generously provided a cat enclosure display to Redland Shire Council’s IndigiScapes Centre. IndigiScapes is a Redland Shire Council initiative to promote ongoing nature conservation, the aim being for all species to live harmoniously together in their natural habitat. The Catmax enclosure demonstrates how Redland’s local moggies can wander safely and freely in an encapsulated space, day or night, without owners having to worry about cat curfews. It also stops cats from wreaking havoc on native wildlife. The enclosure is comprised of pre-stretched, low visibility black netting, and “because it’s black it’s virtually undetectable.” Catmax enclosures camouflage perfectly in natural environments and suburban back yards. 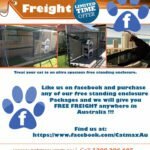 Catmax is Australia’s leading designer and constructor of cat enclosures. The company specialises in supplying free-standing Caboodles or custom designed Clearnet enclosures, which are ultra strong and cat friendly. Catmax netting comes with a 10 year guarantee against stretching, sagging and ultraviolet deterioration. It’s always safer for cats to roam at home. My Furry Kids would like to thank CATMAX for their enclosure.